The Bahnh�usle design has been an incredibly popular design since 1850. Friedrich Eisenlohr of Furtwangen, Germany first submitted the design as part of a contest for the Grand Duchy of Baden. His inspiration was a railroad guard's house overrun by vines and leaves. 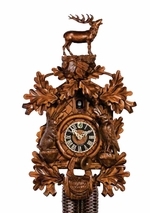 This particular design is from the best known clock maker of the 1850's, Johann Baptist Beha.